The Tsunami XD Talkin' Popper Lures generate a popping, skittering, splashing topwater action to draw reactionary strikes from predators. The large weight transfer balls provide longer tumble-free casts and loud, fish attracting rattles. Tough, colorful finishes with 3D life-like eyes imitate prey species. Matched with extra sharp VMC Cut Point treble hooks to ensure faster hook-sets. 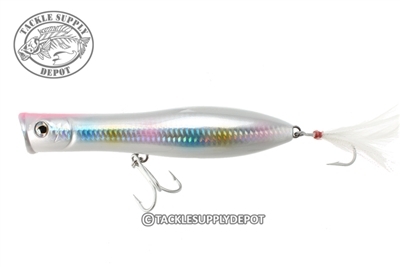 Heavy duty stainless steel split rings and rattles are part of the superior construction, guaranteeing more dynamic fishing. The Tsunami XD Talkin Popper improves on the classic Talkin' Popper Lures.